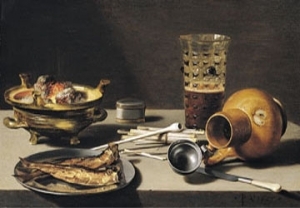 Pieter Claesz, Still life, 1627. MOLA has investigated numerous archaeological sites within the geographical extent of Rocque’s map of 1746 and recorded, researched and analysed the on-site records, finds and environmental material from these sites. A sample of such archaeological data has been extracted for the Locating London Project for two artefact types – clay tobacco pipes and glass tablewares. Chosen because they represent two classes of artefacts frequently retrieved from London’s archaeological sites for the time period covered by the Locating London project. For a detailed account of these datasets see Clay tobacco pipe makers' marks from London and Eighteenth-century table glass. Accessing both data sets displays a row recording an individual glass or clay tobacco pipe form organised firstly by the unique sitecode from which they were found –usually a shortened version of the sites location by address with year of excavation –and secondly by the unique single context number given to the particular excavation unit from which this object was retrieved (for example, a context number would be given to a pit fill, a road surface, a wall etc). The glass tableware data is the more basic of the two datasets, representing the 48 basic object classifications of this material used before it is usually examined in more detail. The fields used to record clay tobacco pipes are more numerous, reflecting the number of possible different attributes for this artefact type. Each column field for both datasets is nevertheless underpinned by a number of explanatory descriptions and for glass examples of particular individual forms have been linked to the Museum of London’s Ceramic and Glass website. It should also be noted that because the Oracle database has been used by the Museum of London Archaeology since the mid 1990s not all sites with glass and tobacco pipes excavated prior to this date have been recorded here. The materials and accompanying stratigraphic and specialist research archives are lodged under their sitecode in the Museum of London’s London Archaeological Archive and Research Centre (LAARC), and may be consulted by prior arrangement. 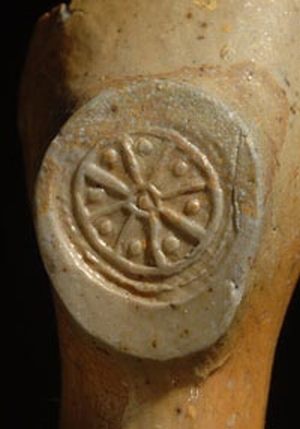 Wheel symbol with pellets between the spokes, stamped in relief on the base of the heel of a pipe dated to c 1610-40. Tobacco plants from the New World were first cultivated in Europe as early as the middle of the 16th century, when they were prized for their exotic appearance and supposed medicinal properties. The earliest English account of a pipe being used to smoke dried tobacco leaves dates the introduction of the practice to the 1570s. English adventurers exploring the eastern seaboard of North America in the age of Elizabeth I had encountered indigenous peoples smoking dried tobacco in pipe-like instruments made from clay. They were quick to introduce the habit to their home country and by the beginning of the 17th century smoking had become popular throughout England, with a pipe-making industry developing to meet the ever-increasing demand. The earliest pipes were handmade but, by the end of the 16th century, the use of two-piece moulds greatly increased productivity and efficiency of manufacture. At first London was the focus of this new industry, although from the mid 17th century onwards more and more centres around the country began to make clay tobacco pipes, each developing their own individual variations on the basic form. In 1619 the Charter of Incorporation of the Tobacco Pipe Makers of Westminster was signed by 36 individuals, representing more than half of the 62 pipe makers recorded in London at this date. A new Charter of Incorporation was granted in 1634 and in 1663 the pipe makers were reconstituted and reorganised as a City Company without livery. From the early 17th century a wide variety of documentary sources increasingly give the names of pipe makers working in London and other centres in the British Isles to which the industry expanded. This was compiled from a wide range of sources, including the charters of incorporation, records of the City Chamberlain’s Court, wills and probate inventories, parish registers, trade directories and a variety of legal records involving pipe makers. Incuse monogram with the initials BT under a fleur-de-lys stamped on the base of the heel of a pipe dated to c 1580-1610. One of the most valuable features of clay pipes, from an archaeological perspective, is that they are closely datable. Improvements in technology, the rapid growth of the tobacco trade with the New World, bringing down prices, and fashion and taste all worked together to bring about progressive developments in the shape and size of the clay pipe bowl. Changes and variations in form can be traced at roughly 30-year intervals, providing an invaluable guide to dating that remains the basis of current clay pipe studies. Pipe bowls of the 17th century were generally rounded in shape, with relatively thick walls, and the top of the rim sloping forward. They increased in size over the course of the century, as tobacco became more readily available. They also began to increase in length so that, by the time of the Great Fire of 1666, stems could reach up to 350mm from the back of the heel to the mouthpiece. At the beginning of the 18th century, the introduction of the gin (short for ‘engine’) press brought about significant changes in the shape and size of pipe bowls, which became taller, less bulbous and more upright, with thinner walls. Common types in use c 1700 remained popular through much of the 18th century, with little variation except in the shape of the heel or spur at the base of the bowl. Around the middle of the 18th century particularly long pipes known as aldermen or straws became popular, especially amongst the gentry, sometimes reaching as much as 600mm in length. By the time of the Napoleonic Wars at the turn of the century, the standard London pipe bowl was an upright form with fairly brittle walls and a small square heel. Much more practical than the extra-long pipes that required leisure time to smoke, these later pipes were often broken to a length that suited the smoker, and could allow them to work with their hands while enjoying their tobacco. Since clay pipes were essentially disposable items, universally and easily obtainable and thrown away after only a few smokes, their potential for dating archaeological deposits is considerable. They do, however, have an importance that goes far beyond chronology, throwing light on the role and history of leisure and recreation in daily life, furthering our understanding of the place of smoking in society and of the organisation of the industry across the country. It was common practice in the 17th century, but not later, to add a band of milling or rouletting around the outside of the rim of the bowl. This could be made with the milled edge of the button or tool that was used to finish the inside of the bowl. The extent of milling is one indication of a pipe’s quality, with the better pipes fully milled. Burnishing is another indication and took place at all periods, although it is more common on London pipes in the 17th century than later. Using a small tool, the surface of the finished pipe was polished in a series of parallel vertical strokes running round the bowl and usually along the length of the stem as well. The closer together and more carefully made the strokes are, the better the quality. More elaborate decoration was usually formed in the mould and became increasingly popular over the course of the 18th century. Some of the more intricate designs involve use of the royal arms, the emblem of the Prince of Wales, emblems of the Masons, the Thames Watermen and other bodies, the signs of public houses (such as the Rose and Crown, the Eagle, the Fox and Grapes), or important events and notable figures of the time, such as the Act of Union, the Battle of Culloden, Admiral Vernon and so on. 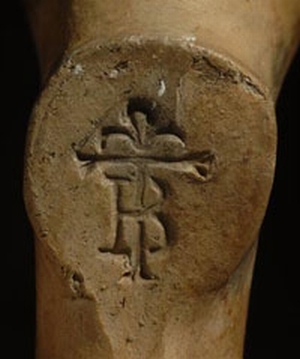 From early on in the life of the industry tobacco pipe makers marked their pipes with their initials or with a symbol such as a fleur-de-lis or a wheel. The majority of pipes were not marked, but those that are give valuable clues to their date and area of manufacture when they can be related to documented pipe makers. This is by no means always possible, especially with common combinations of initials and with symbols. Nonetheless, many London pipes can be identified as the work of known pipe makers. In the 17th century marks were commonly stamped underneath the base of the bowl, but by the beginning of the 18th century the maker’s initials were usually moulded in relief on the sides of the heel or spur. This remained the principal means of marking pipes right through to the 20th century, although stamped marks on the bowl became popular in the Victorian era, together with full names and addresses stamped or moulded along the stem. Throughout the 17th to 19th centuries smoking was chiefly but not exclusively a male pursuit, and there is evidence that women and even children also partook of the habit. The association of smoking with leisure time – for many people a very limited commodity – inevitably made tobacco and alcohol lifelong partners, and filled pipes were routinely available to accompany mugs of ale or beer in London’s innumerable taverns and public houses. From the 1660s onwards coffee houses too were filled with tobacco smoke as gentlemen met to relax and discuss business. By the end of the 17th century, a practice that had begun as something of an exotic novelty had gained an overwhelming hold on society – no longer the preserve of the wealthy few, but available to all, bringing pleasure, escape and contentment to every man. 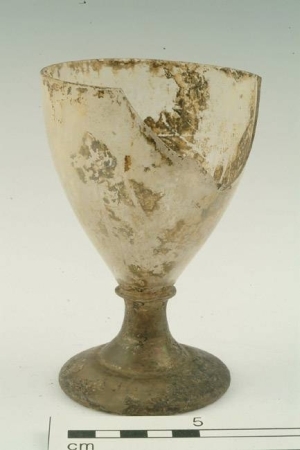 Drinking glass, wine glass or ale glass, MOLA: A14577. 1701-1800. The search form on Locating London's Past allows you to select a particular kind of pipe decoration, or to map all finds of clay pipes. Results are automatically grouped by Place, as the finds relate to very specific sites. Two main types of glass were produced in the 17th and 18th centuries. Colourless glass was used for drinking vessels, table glass, mirror glass and high quality windows, together with a number of specialist products such as spectacles, urinals and scientific apparatus. Green glass, which contained impurities and was less expensive to produce, was mainly used to make wine bottles, pharmaceutical phials and cheaper window glass. Very small amounts of white and coloured glass were also produced and used for decorating vessels or to make the striped and plain ‘trade’ beads which were exchanged for such commodities as timber from West Africa. This database includes all accessioned, clear and coloured glass, however fragmentary, from Museum of London Archaeology (MoLA) excavations, as well as a small number of accessioned green glass bottles and phials. The database provides a fascinating insight into the distribution of the kinds of imported and English glass used domestically and commercially, and demonstrates increased usage as glass became cheaper and more common towards the end of the 18th century. Throughout the 17th century the best quality vessel and mirror glass was imported, mainly from Venice, the Low Countries and France. There was also successful production of good quality drinking vessels in London, principally at Sir Robert Mansell’s London (Broad Street) furnaces (c 1616–42), and these distinctive products – copies or versions of European goblets and beakers in light greyish-yellow soda glass – were obviously kept for many years as they are sometimes found, occasionally mended with lead rivets, in archaeological contexts as late as 1700. During and immediately after the English Civil War and Commonwealth there was a reduced demand for glass, although luxury goods were still imported; a large group of Venetian and Low Countries glass excavated at 1 Poultry in the City of London is thought be part of documented stock imported by the merchant John Greene in the 1660s and 1670s. After the Restoration of the monarchy in 1660–4 the English glass industry expanded rapidly, partly due to the establishment of the Worshipful Company of Glass Sellers (1664) which attempted to control imports and sponsored research into the home production of strong, completely clear ‘crystall’ glass. This was achieved in the 1670s at George Ravenscroft’s London Savoy furnaces – the first English production of glass containing lead oxide, marked after 1677 with a small seal in the form of a raven’s head. This new, thicker and heavier glass was used for novel simpler forms, such as large plain wine or beer glasses, with large funnel- or bucket-shaped bowls and short baluster-shaped stems, spouted posset pots (for drinking the spiced hot sweetened milk curdled with wine or ale known as posset), and plain or ribbed syllabub glasses. The fragmentary posset pots found in the 1 Poultry excavations are thought to be early Ravenscroft products. English glass production took off in the late 17th and 18th centuries, and a high proportion of the new glasshouses were in London. By 1696 there were at least 24 London glasshouses, some of which – for example, the Minories at Whitechapel and Whitefriars near Temple – were to become well known. They made an extremely wide range of products, the most numerous of which were drinking vessels, some with German or renewed Venetian influence, and also many new shapes for specific drinks such as the tall ale glass, the handled tankard for ‘small beer’, the champagne and cider flute, and the small conical glasses for gin seen in abundance in William Hogarth’s print, Gin Lane (1751). The fact that these gin glasses are shown being used by the poor is a vivid illustration of how common some types of glassware had become. Perhaps the most common glass form, used by all sectors of society, was the tumbler, made in a variety of sizes and described in an advertisement in the Norwich Mercury of 5 August 1758 as ‘common glasses, made, in the section of a cone, for drinking water’. But tumblers could also be luxury products – such as the cobalt blue glass tumblers with delicate gilt floral patterns and gilded rims decorated in the London workshop of James Giles (c 1756–70). By the end of the 18th century a vast range of glassware, including cut-glass and wheel-engraved items such as cruets, candlesticks, jelly, syllabub and sweetmeat glasses, decanters, flasks, jugs and bowls, were available for those who could afford them. The majority of the population, however, would still have been eating and drinking from earthenware, pewter and wooden dishes, bowls, plates and tankards, with the cheap mass-produced glass tablewares and ornaments of the 19th century yet to come.